Welcome to your one stop shop for honeymoon inspiration!!! Well hello there! Welcome to the first installment of my brand spanking new honeymoon inspiration travel blog. I’ve been umming and ahhing about writing this blog for a while now and as wedding season quietens down and engagement season is just around the corner it seemed like an ideal time to publish the first installment. I’ve worked in travel almost all my working life before taking the leap into the wedding industry as a wedding florist. This has given me a unique understanding of both industries which hopefully you will benefit from when you’re in need of a little honeymoon inspo! You’ll find here some of your typical honeymoon destinations alongside honeymoon inspiration for adventurous couples, the foodie couple, the mini-moon couple and everything in between! I’d love to hear what you think so please feel free to leave me any comments or suggestions of places you would like to hear more about in the future! Since I took a couple of weeks off to travel Mexico in June I have chewed the ear off anyone who will listen about what an awesome destination it is. The food, the people, the scenery, it’s all SO wonderful. Being the kind of people that need a holiday after their holiday because we try and squeeze too much in we decided to restrict our stay in Mexico to the Yucatan Peninsula, specifically Isla Mujeres, Isla Holbox and Tulum. It is the perfect area for a bit of everything, beaches, food, history, shopping, activities, the lot! Here are 3 reasons you will fall in love with it just like we did. We stayed in a variety of accommodation throughout Mexico and I can truly say each one was beautiful. Our favorite was the gorgeous, boutiquey style Icaco Island village in Isla Mujeres. This place is just pure INTERIORS GOALS. As I know that my brides definitely fall into the boho variety this place is going to have SERIOUS appeal. Imagine white washed walls, lots of natural fibres, dreamcatchers, macramé hammocks on the balcony made by local artisans and a shower made from a huge shell! Each morning fresh watermelon juice and croissants were delivered to our room which provided the perfect start to the day after a few margaritas the night before! The shared areas are also beautiful with an incredible roof terrace and pool as well as a BBQ. We happily whiled away the day here with a bucket of coronas and our books and only saw two other guests the whole day. The real draw to this place though is the incredibly generous host Matthew who shared his wealth of knowledge with us not only on Isla mujeres but restaurants and points of interest for the entire rest of our trip. Ok if we’re being totally honest, the main draw to Mexico for us was the food. We were so excited to try authentic Mexican cuisine and truly it did not disappoint. From street food to high-end restaurants Mexico has it all. The highlight of our culinary experience however has to be Kin Toh. We have truly never eaten anywhere like it. The restaurant is set in a tree house in Tulum in which you can enjoy the most incredible food in your own little nest! While this could end up being a little gimmicky the structure is so beautiful and the Mayan Mexican avant garde cuisine more than delivers resulting in the most unique and downright fabulous way to share a romantic meal! An absolute MUST for any honeymooning couple. Liam’s dessert even came out in its own little tree! Now I’d be lying if I said we didn’t spend a considerable amount of our holiday lazing on the beach with a corona in hand. Mexico has some of the most idyllic beaches I’ve ever seen and I would 100% urge you to soak up the sun lying in a hammock in the middle of the sea in Isla Holbox! However, one of the best things about the Yucatán is the combination of beaches, history and activities. One of the most wonderful experiences of our trip was swimming with whale sharks. Truly one of those pinch me moments that gives you a whole new love and appreciation for nature. We took a tour from Isla Mujeres however you can also experience these beautiful fish from Isla Holbox. 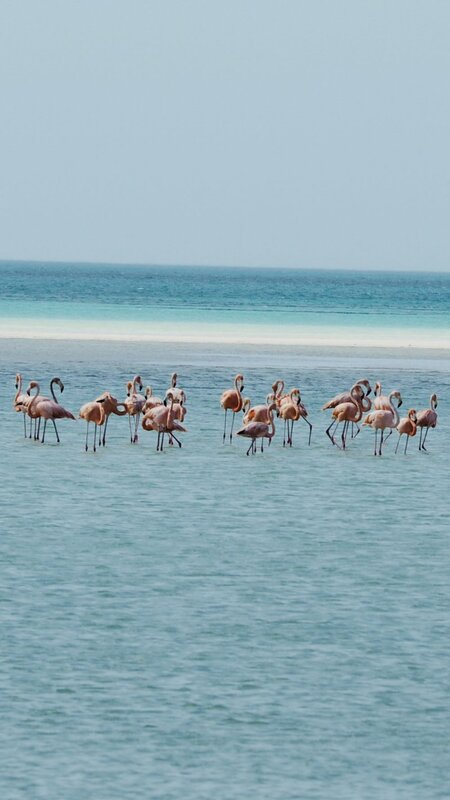 We experienced another wonderful brush with nature on Isla Holbox where we hiked through the sea around the island to catch site of a flamboyance of flamingos (what an excellent collective noun hey?) We only saw one other set of people on the way back (I guess walking through the ocean in the beating sun isn’t everyone’s idea of fun) but this made it all the more special and unique. Mexico has some incredibly interesting history and it would be a travesty to visit this part of the world without visiting some Mayan ruins. We visited both the Tulum ruins which overlook the ocean as well as the more famously known Chichen itza. I’d be lying if I said it wasn’t a little touristy (as is the norm for such famous landmarks) but it was also awe inspiring!! This wonder of the world was a real bucket list moment for me and allows you to gain a greater understanding of Mexico. On the way back to Tulum after our tour we stopped off to visit a cenote. These natural sinkholes are famous throughout the Yucatan peninsula particularly and are the perfect way to cool off after exploring all day. The water was so incredibly clear, birds swooped in and out of hanging vines and small fish swam around us. It was truly magical. I really wish we had found more time to experience other cenotes across the area as I’m told they are all quite varied, you can even scuba dive in some of them! So there you have it, 3 very good reasons to consider Mexico as your honeymoon destination! If you would like more inspiration I’ll be posting on my stories each week letting you know when a new blog is live. I’ll also post about all boho wedding flowers we create around Essex and beyond as well as a good dose of general wedding inspiration from boho wedding suppliers in and around Essex and London so be sure to keep your eyes peeled!